You can now buy a selection of non-leather shoes from the following outlets in London. Outside of London you can visit Vegetarian Shoes which is in Brighton (about one hour by train from Victoria Station or London Bridge). 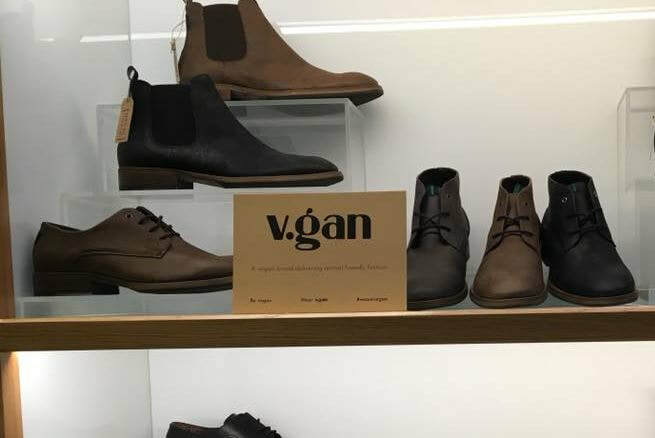 V.GAN footwear is 100% vegan and was started with a passion to provide animal friendly shoes and bags. The entire range is free of animal products, is PETA approved and our workers in our vegan approved factories are protected by European employment and safety laws. VEGETARIAN SHOES 12 Gardner Street, Brighton, E. Sussex, BN1 1UP. Tel: 01273 691913. They stock more traditional men's and women's non-leather shoes (so good for men's office shoes). You can visit their shop, or order by mail order. They also sell trainers, boots, belts and jackets (e-mail: information@vegetarian-shoes.co.uk). Ethical Wares Supply cruelty free footwear (boots and shoes) and accessories. They are an ethical company run by vegans. Freerangers A company providing Vegan Society approved footware, satchels and belts. Veganline Check their web page for non leather shoes, boots, belts, hemp items. VeganStore Online store specialising in products for vegans, including shoes, boots and many other items. Eco Vegan Shoes Dutch based vegan shoe store. Vegan Society approved.